Ten years after Evie Saunders bestowed an aircraft to Tayside Aviation, in which over 260 scholarships have now been completed, Rachel Foyle and Claire Birch have completed a special 10-day trip in Evie’s honour to entice more women into the industry. At present, only 12% of UK pilots are female, with the worldwide figure even lower at just 6%. The trip saw Rachel and Claire fly 1,000 nautical miles, landing at 12 different airfields across the UK. 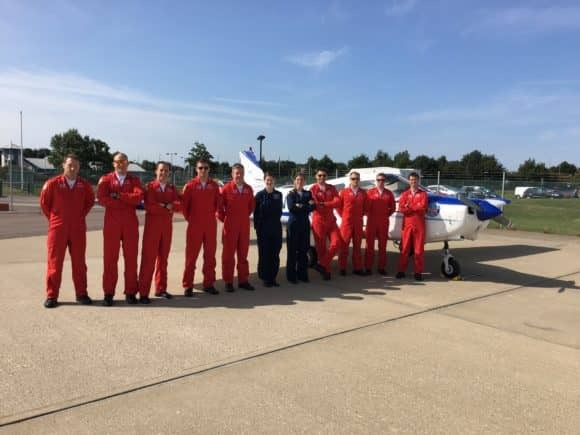 They even managed to hook up with the Red Arrows while visiting Norwich airport. While stopping at Bournemouth, Rachel and Claire also met Evie’s niece, Lorraine Richardson who presented the first in what will be an annual ‘Evie Saunders Scholarship’ worth £2,500 to Tayside Aviation student Lauren Sims.The two-week, 12 hour scholarship will allow Lauren, from Wiltshire, to complete her Private Pilot’s Licence (PPL). Rachel (23), a University of St Andrews graduate, began her PPL training at Prestwick aged 16, flew solo later that year and gained her PPL fixed wing licence at 18. Rachel is also one of 15 women currently enrolled on the BSc Professional Pilot Aviation Practice course at Tayside Aviation.